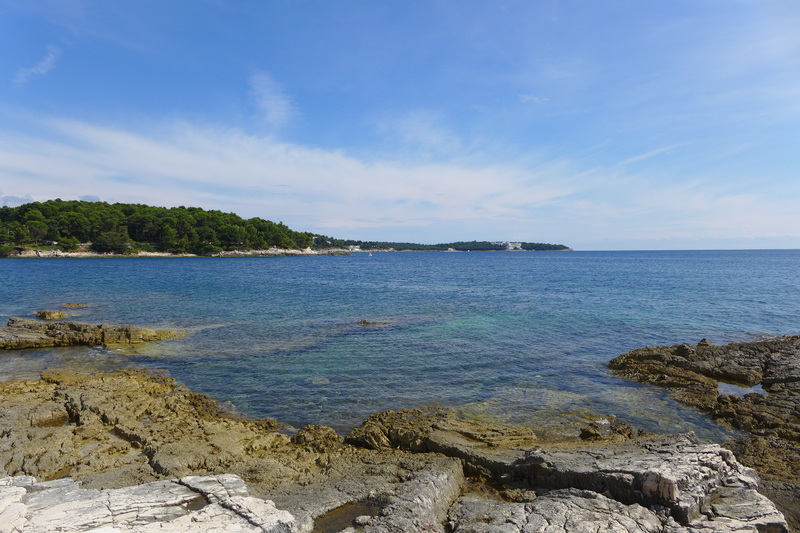 Following a smooth arrival and good night’s rest in Rovinj, I hopped on a bus going South to the next appealing city along the Adriatic coast. To be honest, I didn’t have much of a plan for Croatia except staying around a week or so, heading down the coast and eventually making my way to Dubrovnik. Recalling the name “Pula” as one of main destinations for ferries departing from Venice, I thought this port city on the tip of the Istrian peninsula a worthwhile next stop. From there, depending on any tips from locals or travelers I may meet, I could either take a ferry to expedite my journey down the coast or continue on land. Arriving after a quick 40 minute bus ride, I began walking towards the town center where I would begin my hostel scavenging. 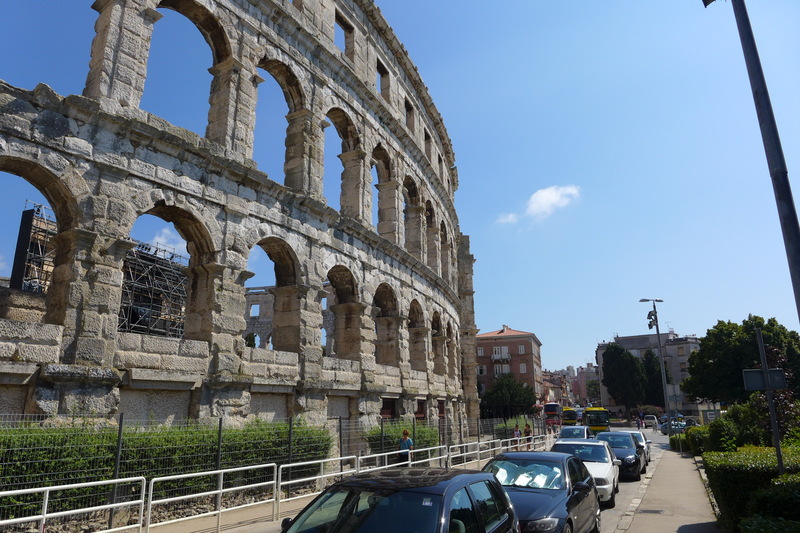 On the way, I was surprised to pass a series of incredibly well preserved, ancient Roman structures, the most respectable of which was a large amphitheater sitting just on the border of the town center. The structure towered over the neighboring houses and trees, creating an interesting dichotomy with the surrounding Mediterranean architecture and environment. 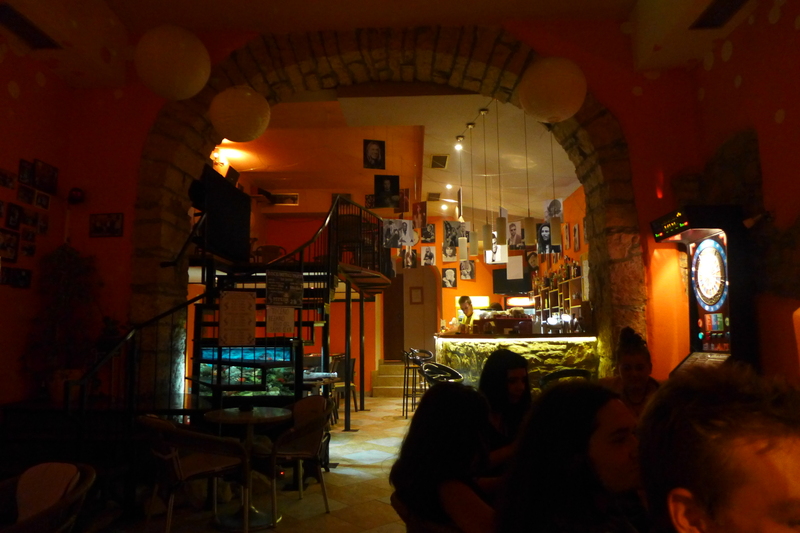 Intrigued by the city and keen to explore, I booked two nights at a central hostel and began wandering. Not too crowded, the main street had a fair number of tourists. However, due to the strong resemblance of Croatian to the other Slavic languages, it would still take me a while to differentiate between the locals and visitors from neighboring countries. 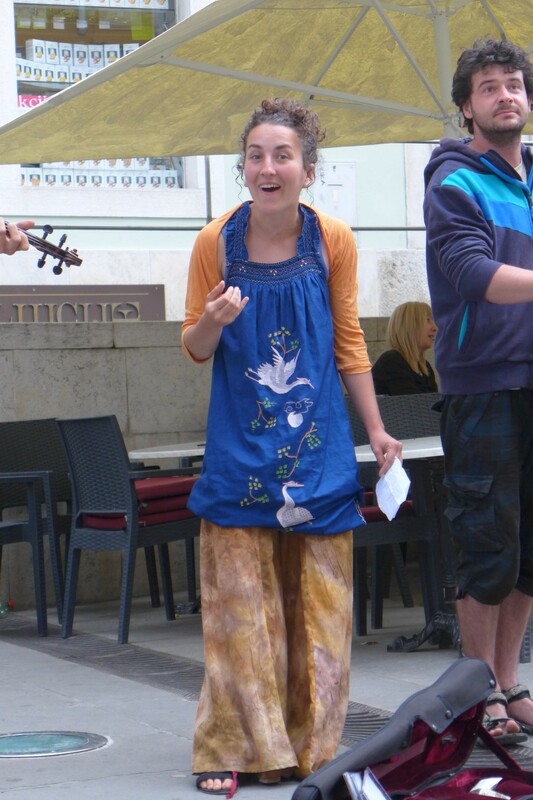 What I could make out, however, was the slightly accented English coming from a group of backpacking musicians sitting outside of a coffee shop, and soon introductions were being made. 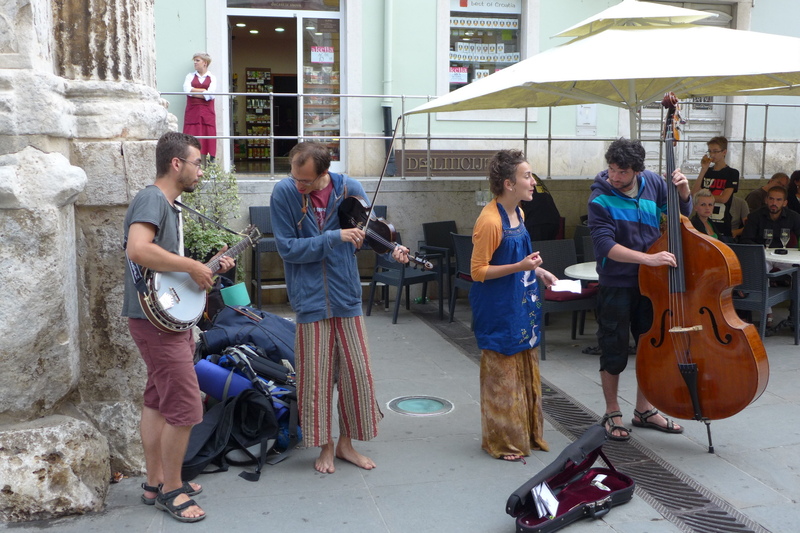 A jazz band from Prague, my four new young friends were working their way around Southern and Eastern Europe, camping by night while performing on the streets and in various venues by day. An eclectic combination of vocals, bass, violin and guitar (modified to fit a banjo body), the currently unnamed group had decided to take off after graduating from university, temporarily leaving an unforgiving job market in the Czech Republic and funding their travels through performing. Their free spirited nature and love of music was contagious, as other musicians in the city would occasionally stop by to drink, chat and play. 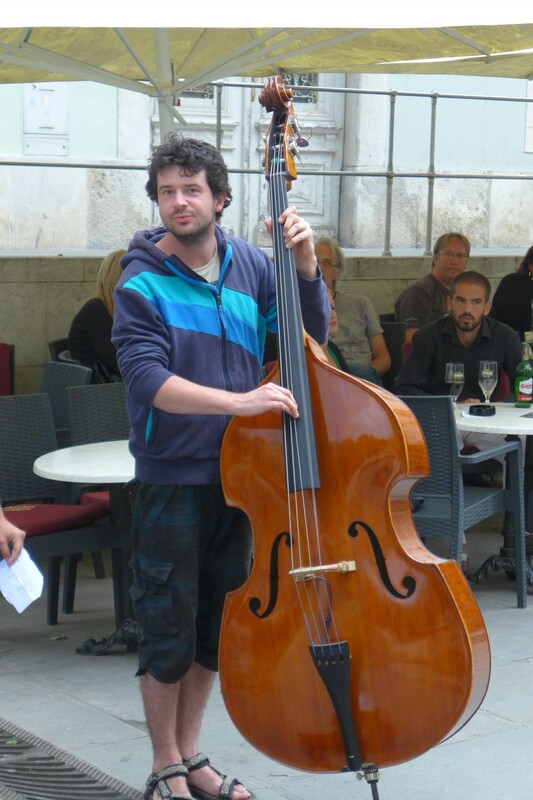 I was particularly impressed that Vladimir, the bassist, was able to juggle his heavy pack and gargantuan instrument all over the city, let alone half of the Balkans. After talking for a few hours, having spontaneous jam sessions, and meeting various other musicians, I agreed to accompany them to their main spot under a Roman arch, excited to see the talented group perform together..and so my musical adventure began. 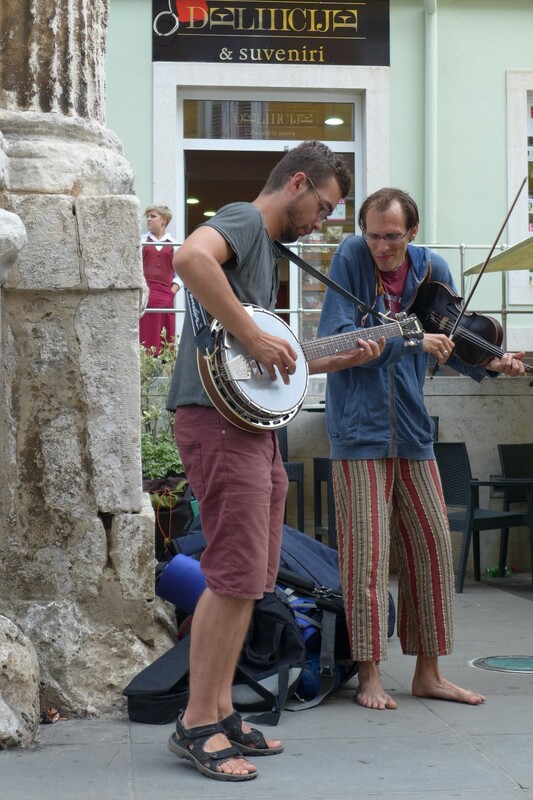 For some reason, Pula seemed to be a melting pot of street performers. 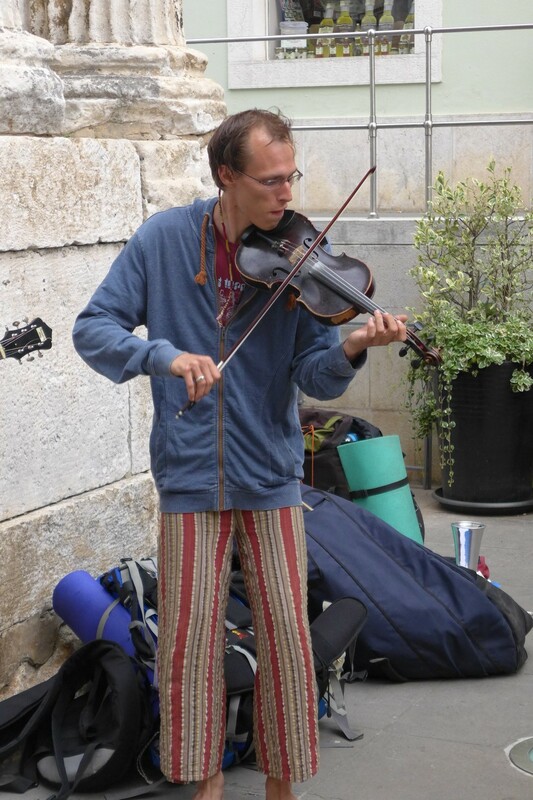 Something about the city attracted musicians from all over. Or so it seemed…there might not have been any more musicians there than, say, another touristic city along the coast, but the small city center and social street culture created a lively environment that brought people together. And in doing so, the performance under the arch created another jubilant atmosphere, and I was soon invited to a heavy metal bar with a group of young local headbangers. Through the curtain of thick cigarette smoke and blasting Iron Maiden, I began familiarizing myself with the dozen or so faces I would be seeing much more of over the next two days. All roughly my age, everyone in the group spoke perfect English, a virtue they credited to movies and video games. But it was more than the lack of a language barrier that made us get along…from the second I arrived, everyone was very welcoming, naturally switched the conversation to English, and treated me as if I had been a regular in their group. A traveler new to Pula who joined our group later that night was surprised to hear that I had just arrived as well, commenting that it seemed like the group had known me for years…but soon the same was true for him. It was this warmth and familiarity, among other things, that would draw me closer to the Croatian people. Just in my first few hours in Pula, I had already observed many similarities to my Turkish culture, resulting both from the strong, past influence of the Ottoman Empire, as well as the lifestyle and culture that associates with Mediterranean (Adriatic) societies. We shared the same cuisine, understood each other’s natural gestures, used identical colloquialisms and, although not as evident, also shared similar features (slight nuances hidden beneath the predominantly Slavic appearance). Apart from a few friendly disputes over whether ćevapčići, a meatball dish called köfte in Turkish cuisine, was originally a Croatian dish or not, we laughed over stories and cheap, local beer. So my new friends and I began the night with Metallica and medenica, a sweet and delicious liquor made through the distillation of fermented honey, and were soon singing to guitar chords of classic American rock songs in the park, a routine that lasted till the early hours of the morning and defined the rest of my stay in Pula. The last few hours I spent in Pula were on the beach with a few friends, trying to decide whether I should hang out until the morning and take an 8 a.m. bus to the next city, Zadar, or hop on the night bus at 8 p.m. The sun and sea had worn me out, so despite wanting to spend another night, I decided it would be best to get some sleep and arrive refreshed in Zadar. So saying my goodbyes, I went to the bus station and was soon fast asleep with fond memories of an incredible city that I will definitely be revisiting. What a great group of travelers! You are so lucky to meet such spectacular friends! This looks like so much fun! I was in Dubrovnik in 1964, on a trip a little like yours. Only word I remember is “ya ya” (egg). Good to travel at night! Saves money on sleep-stops. ENJOY! I just arrived in Dubrovnik three days ago, quite a place! And night travel is a great way to save indeed, except when the bus arrives at your destination at 3 a.m.! Thanks for your good wishes. I am kinda of thinking that if you enjoy the rest of your trip as much, you will never come back………. The photos add so much to your travelogue; thanks for the vicarious journey. Thank you for following, I am glad you are enjoying the posts and photos!